America loves technology. As a nation, our cultural predilection for technical ingenuity has created the conditions for economic prosperity, scientific discovery, and military superiority. However, the worldwide proliferation of American free market ideas and liberalism (not to mention technology) has led to the emergence of an increasingly competitive global innovation landscape. According to the World Intellectual Property Organization, the U.S. represented just 26% of world total patents in 2012, down from 40% in 1999. During the same period, the number of patents filed in China increased by some 3,200 percent, growing to roughly 10% of world total patents today. In a related trend, the technological state of the art is shifting from the advanced militaries of the world to the commercial marketplace. An October 2014 update by the Defense Business Board makes the startling claim that “commercial technology…is more advanced in most areas critical to military capabilities.” To the extent that the commercial marketplace is predicated (more or less) on the free flow of goods and ideas, it is not hard to imagine a world where America’s peer competitors and non-state adversaries achieve technological parity with the U.S. military in many important areas. During the Cold War, the U.S. relied on qualitatively superior weapons systems to “offset” Soviet military mass. This imperative led to the emergence of a captive industry servicing the U.S. military’s warfighting needs. The migration from a dual-use defense industrial base in World War II to a defense-specific industrial base created a dependency between public financing and military-relevant technologies. This connection has been an important factor in ensuring America’s military-technology edge; however, there are forces at work that threaten to undermine such a model. The “democratization” and proliferation of advanced technology, the shift in research and development spending to the private sector, and the convergence of commercial, consumer, and defense applications allow nations, organizations, and individuals alike to capitalize on military-grade technologies more quickly and cost effectively than ever before. As the Pentagon is set to deploy a new offset strategy focusing on the development of “revolutionary” defense technologies, the Center for New American Security – War on the Rocks “Beyond Offset” series is exploring the key factors relevant to ensuring America’s military competitiveness. In this context, it is worth considering how the contemporary technology environment should inform the new offset strategy. In a world where advanced technology has entered the public domain, can the U.S. reasonably expect to command a decisive, full spectrum technological lead? With innovation cycles accelerating at faster and faster rates, should DOD make “big bets” on a small number of technologies? Does it make sense to aspire to overwhelming technological superiority at the expense of greater numbers of commercially derived capabilities? These are some of the key questions that DOD must answer. The technology-first mindset punctuates Department of Defense (DOD) decision-making from top to bottom. The U.S. government has at times found it difficult to supply basic equipment required for large scale military operations but has consistently risen to the occasion when it comes to the development of advanced capabilities. In an interview for this article, Major General (R) Buford C. Blount, former commander of the Army’s 3rd Infantry Division, noted that approximately 600 sets of Small Arms Protective Insert (SAPI) plates (i.e., body armor) were supplied to his 19,000 soldiers at the launch of the ground invasion during Operation Iraqi Freedom. Similarly, it took years for the Army and Marine Corps to furnish sufficient handheld radios to meet the needs of ground forces in Iraq. This state of affairs is easily contrasted with the massive development efforts that accompanied the emergence of the IED threat in Iraq. From Counter Radio Frequency IED Electronic Warfare systems to Mine Resistant Ambush Protect vehicles, DOD leaned-in to the IED threat with a massive technology campaign reminiscent of the ambitious industrial-scale research and development efforts of prior generations. Today, technology bias can be seen at work behind closed doors in the Pentagon, where personnel training and readiness accounts stand to assume a disproportionate share of shrinking defense budgets. Technology as strategy stems at least in part from the perception that American military technology played the decisive role in the post-World War II conflict arena. In support of this contention, strategists point to the causal relationship between the United States’ qualitative military-technology superiority in the Cold War and the eventual collapse of the Soviet Union. To its proponents, the culminating milestone of the techno-centric strategy was Operation Desert Storm, the overwhelmingly one-sided conflict that pitted advanced American military capabilities against conventional mass and signaled the birth of the Revolution in Military Affairs – the abortive antecedent to the Pentagon’s current offset campaign. “In the year 2054, the entire defense budget will purchase just one tactical aircraft. 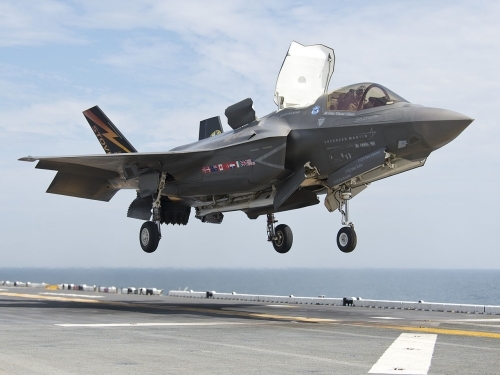 This aircraft will have to be shared by the Air Force and the Navy three and a half days per week except for leap year, when it will be made available to the Marines for the extra day”. The Democratization of Technology. During the Cold War, the capital requirements associated with advanced military research and development favored nations with the economic muscle to make such investments and the talent to exploit these investments. This combination of factors were major contributors to the United States’ military-technology edge. Current trends, however, are eroding this historical advantage. Through the mid-1980’s, the U.S. government was responsible for the preponderance of global research and development spending. Today, by contrast, the U.S. government accounts for less than 5% – a dramatic shift that is primarily attributable to the explosion of private sector investment accompanying the high tech boom. Throughout much of the 1990’s and 2000’s, venture capital favored opportunities with low technology risk, many of which focused on the exploitation of technologies substantially underwritten by public financing. During this period, corporate research and development spending produced a wide spectrum of component-level innovations that the military sector has, to a greater or lesser extent, successfully internalized in the development of advanced capabilities. More recently, however, the investment trend has shifted towards system-level innovations with potentially disruptive relevance for military applications. Robotics, space systems, computation, networking and communications, and transportation are all areas where the commercial marketplace has taken an increased interest or assumed an outright lead over the traditional defense industrial base. The rapidly expanding global technology commons constitutes an unprecedented transnational ecosystem operating outside the control of individual nations yet with the power to directly influence the military-strategic landscape. Market-based proliferation of capabilities and systems once exclusively reserved for the advanced militaries of the world makes it less and less likely that any one nation can build and sustain a decisive, broad-based military-technology advantage. The Acceleration Factor. The democratization of military grade technologies is also linked to the emergence of low cost prototyping and manufacturing equipment most prominently associated with the nascent “maker” movement. The availability of 3-D printers and scanners, software-based design tools, and network-enabled marketplaces offering an endless assortment of commodity and bespoke components is mitigating cost and time as a barrier to advanced research and development. Leveraging the Internet, start-ups, sub- and transnational organizations, and super-empowered “creatives” are able to access and share rich information resources enabling new forms of distributed, social-scale technology development. The decentralization of research and development beyond the confines of government labs and corporate research centers is a trend that foretells exponentially accelerating rates of technology innovation over time or what technology futurist Ray Kurzweil has dubbed the Law of Accelerating returns. Low capital costs, open innovation approaches that distribute technical and financial risk, and agile development methodologies are also changing the overall R&D economic value proposition. The significant investments and lead times associated with traditional research and development impose a long technology half-life (i.e., employment timeframe) in order to recover sunk costs. As the forces governing the contemporary technology landscape are driving faster and faster innovation cycles, the rate of technology obsolescence (i.e. the period of time before a technology is overtaken by new innovations) also increases. Ultimately, this dynamic stands in opposition to the “big bet,” revolutionary technology mindset at the heart of the Pentagon’s new offset strategy. The Quantity Question. Perhaps an even more fundamental question is whether, in the current fiscal and technological environments, it is advisable to pursue qualitative military-technology superiority at the expense of numbers. During World War I, English mathematician and father of the field of operations research, Frederick William Lanchester, devised a set of differential equations to describe the power relationships between opposing military forces. Dubbed Lanchester’s Laws, the equations predict that the power of a force in “modern” military engagements is proportional to the squared number of individual warfighting units. Writing as he was at the beginning of the twentieth century, Lanchester did not make specific allowances for the force multiplier effect of advanced technologies, to include everything from nuclear weapons to guided munitions. He, therefore, concludes that a force will require an N-squared increase in technology quality to compensate for an adversary’s N-fold increase in quantity (i.e., quantity trumps quality). Even if we assume a more conservative model, where the impact of technological quality is proportional to quantity, Lanchester’s Laws have stark implications for a techno-centric offset strategy that imposes trade-offs between quantity and quality. In the case of the F-22, the world’s premier air superiority platform, a single aircraft can carry up to eight air-to-air missiles and simultaneously engage up to four targets. Regardless of its awesome capabilities, however, one cannot help but wonder how the F-22 would perform in a battle of attrition against swarms of relatively low cost, ultra-maneuverable Unmanned Combat Aerial Systems like the Kratos UCAS-167A – an aircraft derived in part from a U.S. built, high performance target drone. What happens, for instance, when the F-22’s limited missile complement is expended on waves of “good enough” opposing aircraft? Moreover, every loss due to maintenance or operator error would disproportionately impact the qualitatively superior, but numerically inferior force – an asymmetry that could spell disaster in a protracted campaign. Not Your Father’s Offset. Notwithstanding the above, it should go without saying that technology is an important part of American military strategy. In an era where market forces have both catalyzed and metastasized advanced research and development, however, the way we think about technology as an element of military power should evolve. DOD’s historical bias toward qualitative technological superiority must be balanced by cost, quantity, and obsolescence considerations in order to sustain a force that is both numerically sufficient and operationally relevant for a full spectrum of military contingencies. As technology continues to evolve at faster and faster rates outside the confines of the traditional military-industrial complex, lower financial and organizational barriers to adoption favor nimble, emerging powers. Within this context, long-lifetime, high cost, “exquisite” weapon systems represent a potential strategic vulnerability increasingly at risk of innovation-fueled disruption. Once upon a time, the combination of American defense and American industry was an unstoppable force that won two world wars. Today, however, a highly specialized and financially dependent defense industrial base has replaced the manufacture of high quality military capabilities substantially underwritten by dual-use infrastructure and know-how. The efficacy of the current model is predicated on DOD maintaining a virtual monopoly on advanced military-grade technologies – a state of affairs that no longer exists. With the unconstrained proliferation and acceleration of R&D, individual technologies are no longer sustainable differentiators. In this environment, DOD needs an offset strategy that’s less concerned with finding the next “golden BB” and instead enables the U.S. military to become the world leader in rapidly, systematically, and sustainably internalizing (and complementing) the high tech outputs of America’s most sustainable competitive advantage – the commercial high tech marketplace.